Do you have any early memories of artistic activity? I have always been a creative person but I haven’t always been in the same discipline. When I was 14 I was working as a make-up artist. I worked on special effects as well. I also worked for a make-up company and I did marketing for them and on occasions I would do some graphic design. What about school. Did you do art at school? When I was in high school I did an apprenticeship in graphic design but I sort of fell out of love with graphic design. At school, I was very into sculpture. 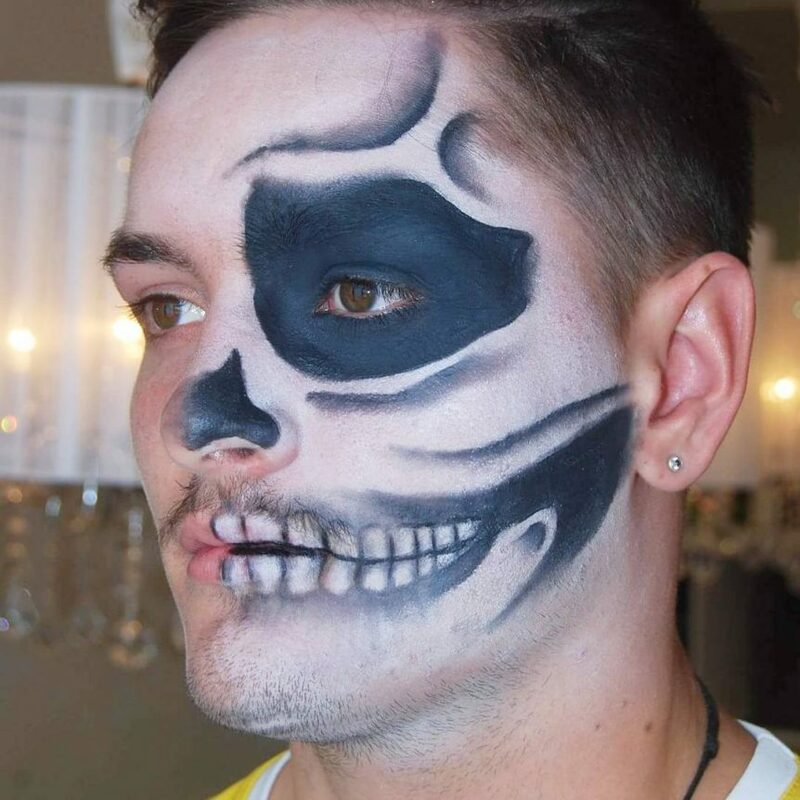 I would make latex masks and apply make-up to them and that would be my assignment which I would hand in. I didn’t do drawing or painting though. I wasn’t interested in that side of art. After school, as I said, I did end up working in sales and marketing and wasn’t being directly artistic. So you were moving away from being creative? Not completely, but I went through a very difficult period in my life; 24 years old, a relationship ended, I had to move house, I couldn’t work out exactly where I was heading and I developed high levels of anxiety. I always had difficulties with anxiety but this was an extremely difficult period. Someone suggested to me that I take up some artistic activity to slowly improve how I was feeling. I started to go outside, to go to the beach, to draw, to take my mind off the difficulties I was having. The point was to get my mind occupied by something other than what was troubling me. Yes, initially. I started off trying to do portraits and I wasn’t very good at that. 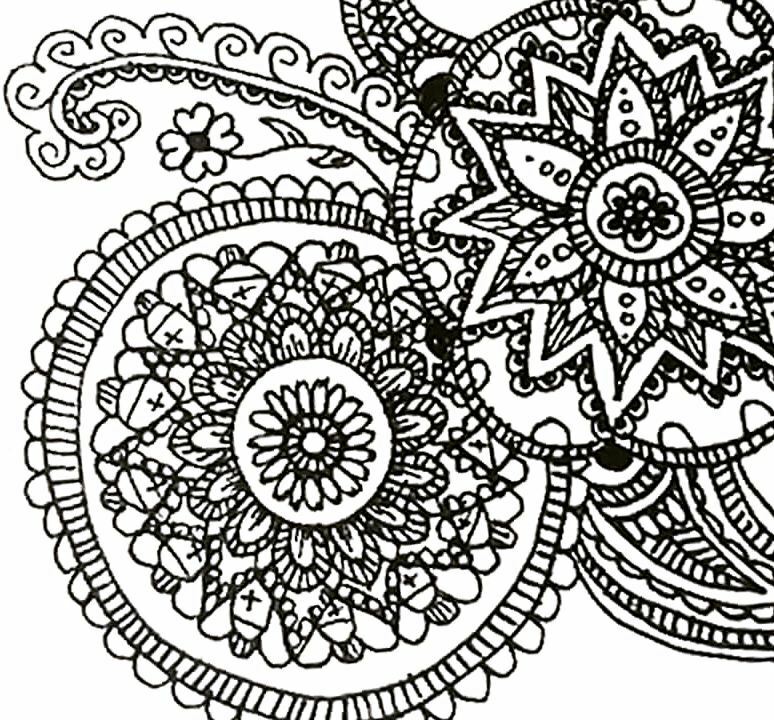 I then worked on mandalas – line drawings. They seem so simple, but as you build up the lines you create fantastic pictures and I really enjoyed that. 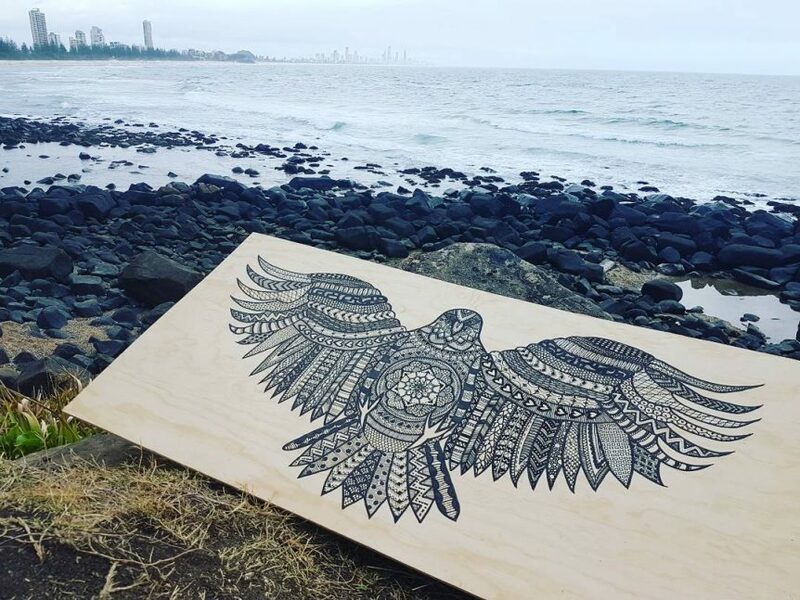 I would go to Burleigh Headlands and set up there, listen to music and draw; basically things that meant something to me. I was in my own world and enjoying being outdoors and being creative. Eventually I decided to get a big sheet of plywood and I worked on a much larger painting. While I was doing this, as time went by, people would come past and ask if they could buy my artwork. That was great but I really wasn’t set up for that. Did you organise to start selling your art at that point? I wasn’t really able to do that at the beginning. People would ask me for my paintings but I tended to just give them away rather than charge for them. I was still doing the art work for the love of it. I eventually set up a Market Stall and tried to sell my paintings that way. My first attempt didn’t work out because I didn’t sell anything. That must have been a disheartening? It was. It felt like I had gone backwards at that point. I didn’t do any painting for a couple of weeks after that. On Valentine’s Day I was by myself and I went to the beach and was going to paint again. I met a homeless man and he spoke to me and gave me some crystal rocks; he enjoyed searching for them and they meant something to him and he gave them to me because he wanted to share with me what he did. That was a Time Stamp moment for me. At that point I realised that I should to do something I love, and to follow the direction regardless of setbacks. I started to work on building my own profile and letting people know about what I was doing and what journey I was on as well. Is this when you started to use Instagram? I had been using Instagram but not quite to the extent that I use it now. I did decide that Digital Marketing would be the platform that would work well for me. 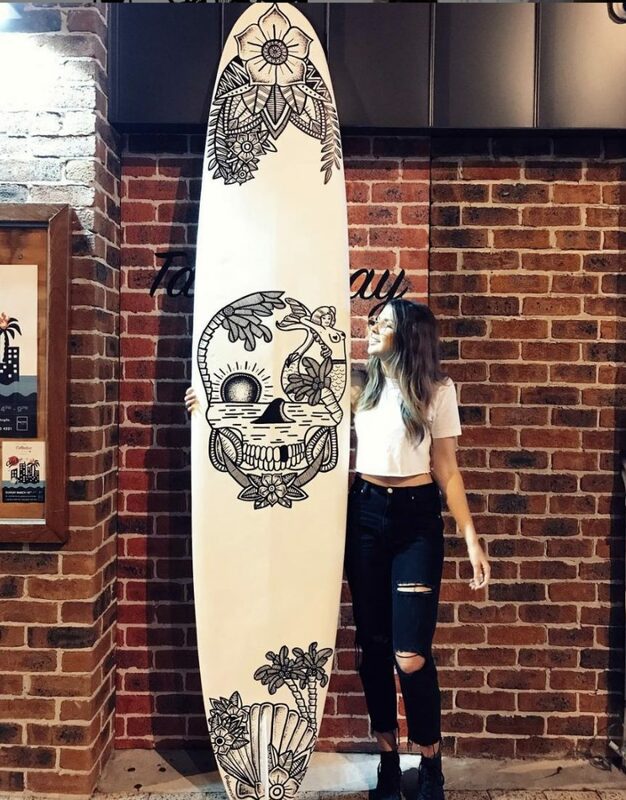 The break came when I was at a surf event and a famous surfer, Joel Parkinson, came up to me and I asked if I could work on a design for his surfboard. Things built slowly from there. People would contact me on Instagram to see if I was going to be painting at Burleigh Headlands. I would get some small commissions, nothing substantial but I was getting work. How do you move forward from that position? Another break came when I saw a blank wall at a pub, the Wildernis Bar and Café at Palm Beach, and asked if I could paint on that wall. The owners offered me the wall and that forced me to work out how exactly you could make that happen. At the time though, I didn’t know how to scale up the painting or what paints to use or the techniques that were needed but I just set my mind to it and made it happen. 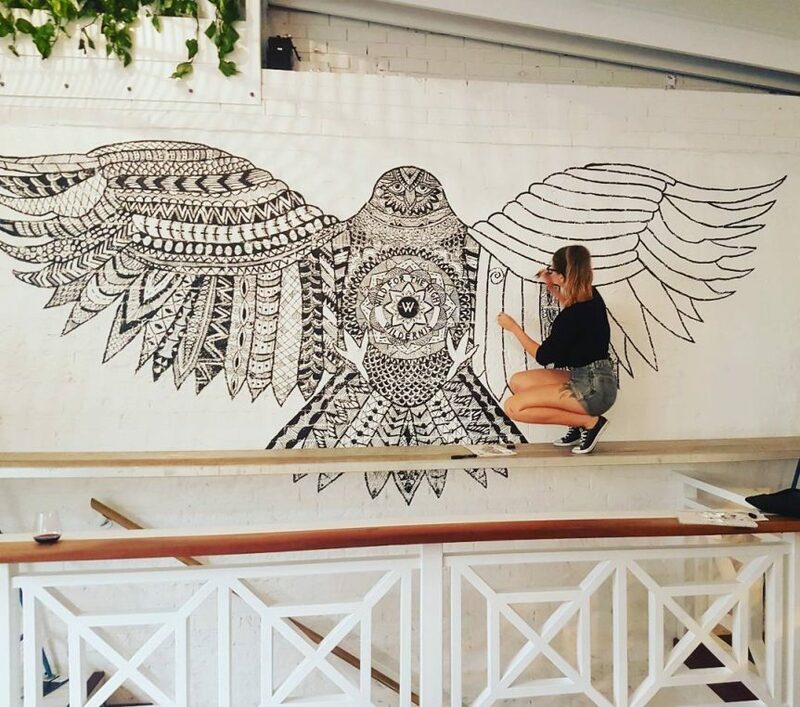 The mural was a line drawing of a giant Eagle which I think you can see from the highway as you drive past and the Wildernis people use that image on their social media quite a lot. You seem to like being thrown into the deep end? The Wildernis job gave me a lot of confidence and it also gave me a portfolio. I started to chase work and people started to come to me. I was asked to paint in people’s houses. I would go into other café’s and ask the owners if I could do work for them. I was asked to do other murals. I got very lucky when I met a good paint supplier. I was able to get access to paints from Ironlak Art & Supplies and that worked out very well. It meant that I could look at doing larger works and know that I could get the materials to complete them. You were one of the artists selected to work on paintings for the Commonwealth Games at the Gold Coast? 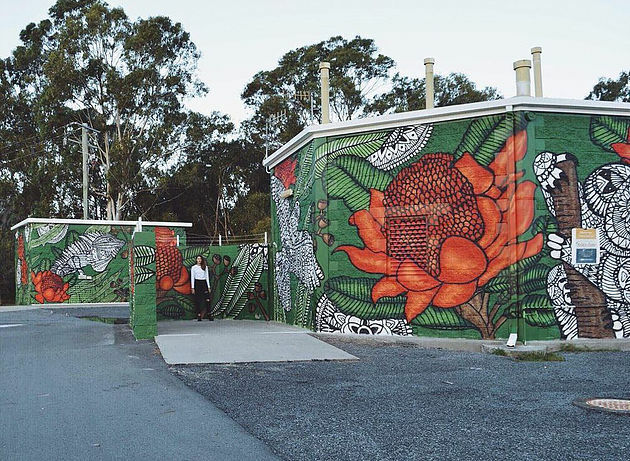 The Water Walls project was one of The Gold Coast City Council’s largest ever urban art projects. They selected nine artists from around Australia to transform existing infrastructure into something attractive and which reflected the unique character of the Gold Coast. How that came about was that I had contacted my local councils and I said that I would like to work in community arts. That led to me finding out about the Water Walls project. I sent in my information to the bodies that dealt with the applications and I was selected to put up one of my paintings. I worked on a small site initially and then I was selected to do a very large site. It took 2 weeks of solid painting to create the work for the Commonwealth Games. More information about Danni’s Art can be found at the links below and all photos are courtesy of Danni Simpson Art.